There has been one LEGO kit that Seth has been pining after for quite some time. For years it has been top of his wish list and every now and again I would find Seth Googling images of this saut after kit, hoping for it to appear in his room. It's not that I am tight, we spend a small fortune on LEGO but I couldn't warrant spending the best part of £300 despite how much we wanted it on something I was convinced we could build ourselves from the LEGO we already had. It was something that came up in conversation every now and again but we always managed to end up building other things. It wasn't until we were leaving the Golden Brickies Lego awards earlier this year that I felt a surge of building inspiration. The boys were very kindly given the LEGO Star Wars advent calendar by a lovely lady (you know who you are) and instantly I had an idea for a review. We do like to go all out with many of our reviews and the build up to this one ended up being one of the most fun. 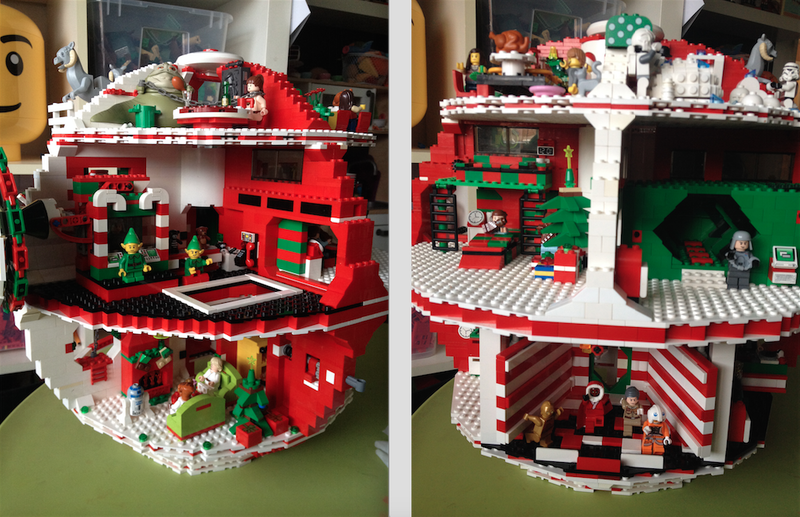 With so many fun Christmas themed Star Wars Minifigures and parts included in the advent calendars over the last four years, I thought it would be fun to finally recreate the kit Seth has wanted for so long, using the LEGO we had, but giving it the Gifts from the Pirates Christmas twist. 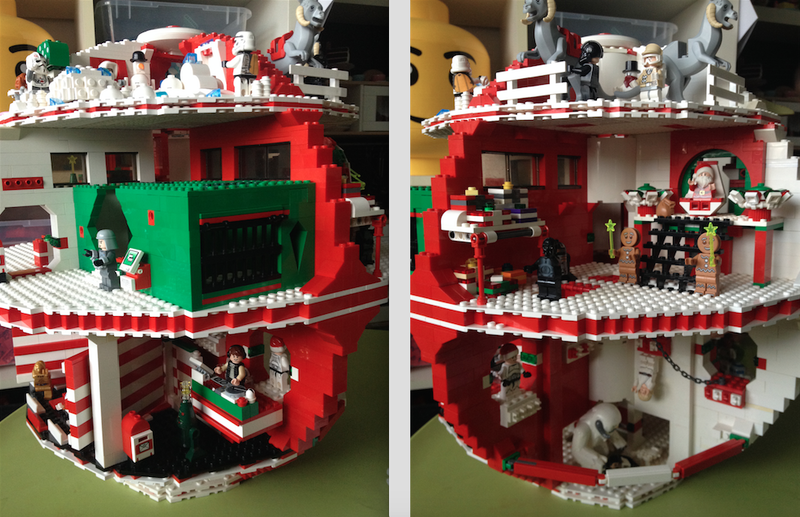 You may have already guessed that the kit Seth is so desperate to own is the LEGO Death Star and this custom Christmas version was an absolute joy to build. I'm so pleased with how it came out but most importantly it has put the biggest smile on the boys faces and has been something they can't stop playing with. Obviously i love all LEGO but there is a lot of grey on the original build. I love colour and lots of it, So we went for Red and White candy cane colours and added in lots of green accessories, giving it a proper Christmas look. Even now we would still love to own LEGO's Death star kit (because it's a great build), but sitting down together and building our own custom version was amazing, bouncing ideas off each other and letting our creative juices flow. The boys really got in to making accessories and they came up with things I hadn't even thought of (Under estimate not the power of your child's imagination). One of the first sections of the build to go in was Santa's thrown room, Which the boys soon had taken over by Vaderclaus. It was the room originally used for the emperor but as we didn't own that Minifigure and the fact I was lucky enough to end up with an extra few characters from the advent calander from a friend, it made sense for Darth (in his Christmas attire) to take charge. The boys had the real Santa cuffed and kneeling before the Sith Lord and both were adamant that the gingerbread man was his head henchman. We added piles of gifts and the dark looking C-3PO and R2D2 along with the emperors guards holding wands for effect. While doing my usual mooching about on Bricklink I noticed a Chewbacca micro figure from the LEGO Star wars battle of Hoth game And thought how cute it would look in a bedroom scene with Han and chewy, off to bed ready for the big day. Seth added PJs to Chewbacca which I thought was cute and we added hidden compartments under the bed for blaster storage. Because we loved the look of the original kit so much we wanted to keep certain parts of the build in our own. The compactor room didn't really fit with our Christmas aesthetic at first but Seth came up with the great idea of turning it into a dance floor, placing his Minifigures in mid dance positions (I love this). I made a disco ball to add above which moves with the compactor lever for effect but you can't have a dance floor without music. I noticed the gamer Minifigure from the latest series lying on a shelf in Seth's room and knew those headphones would look great on Han. A Dj booth was quickly built on the right hand side of the compactor and it all started to come together nicely. On the left hand side of the compactor we used the space to build a kitchen scene. The back of the compactor doors were great for adding in pots, pans and plates and the space was perfect for building an oven for those storm troopers to get started on the turkey. The LEGO boxing gloves worked perfectly as oven mitts. Through the archway and into the next room we decided on building a lounge scene. Christmas is great for just lounging on the sofa with your family and why shouldn't the Jedi have the same festive relaxing fun. We built some sofa's, a fireplace (with stockings) and of course a Christmas tree which we have many of throughout the build. We wanted to recreate a couple of parts from the movies and secretly I think the boys wanted an excuse to order some of the characters from the Empire strikes back Hoth kits so (arm twisted) I ordered a Wampa and a couple of Taun-taun's. As soon as they arrived we added in the Wampa cave from the start of TESB (with Luke trapped obviously) and an upper level penn for the Taun-Taun. My favourite part of the build was the satellite dish/lazer. We used the original design from the kit so that I knew it would be sturdy but added in candy canes for the Christmas feel. We had moved the dish from its original room to make space for Han and Chewbacca's bedroom and it looked a little sparse, so I added in a toy production line to the rear along with a couple of Santa's elves. I really wanted to use Jawas as elves but paying almost £10 a figure on brick link didn't seem at all appealing (maybe I'll add them in at a later date). We tried to keep to the characters from the original three movies but as we didn't have the Boba Fett Minifigure, Jango made an appearance as a postal worker, collecting letters for Santa (which i thought was a really cute idea from Seth). The boys were eager to have Jabba the Hutt somewhere on the build so we gave him a room with Leia (in that gold bikini of course) chained up and playing cards. The top prize being the release of Han Solo, trapped beside them in the carbonite. When we started the build i really wanted there to be a snowball fight going on and also an ice skating rink. I'll be honest the skating rink looked awful and despite sitting for a good 2 hours trying to get my head around it, it didn't look how i envisioned and we eventually ended up scrapping it. The snowball fight stayed though and the Storm troopers looked like they were having an awesome time. We thought the jail area on the build was a great looking addition so we kept that in ours but changed it from black to green. We only used the original instructions for the outer shell but I'd love to see the original completed to check out all the accessories included (maybe Vaderclause will send it us for Christmas? who knows). I used to be one of those builders that wasn't all that interested in the kits but now I'm hooked because you can learn a lot from the designers at LEGO. Looking at the the kit designs has helped us view parts differently and join Parts we would have never thought of putting together. As with pretty much everything we build especially larger buildings we always try and include our own Minifigures into the build. So for our final room we recreated our own family Christmas lunch. Were not meat eaters here but as LEGO are yet to release Quorn products i used a turkey for effect. Polly also appeared on her first LEGO build debut and because of the size of the Death star the game 'where's Polly?' is now a thing. We take it in turns to hide the cat and then our Minifigures have to go searching for her (it's a lot of fun). Seth totally blew me away with his ideas on this family build and towards the end as we were nearing completion he really made me chuckle by saying "when we build I'm like the designer, adding in all the finishing touches." and he is so right. All the little parts that may not stand out all that much at first glance, really make the build. Intercoms, Phones, clocks, Christmas trees, they are all Seth. The postboxes and letters were his idea too. His LEGO ideas are so inspiring. We invited our friend Steve round (another LEGO geek) to have a look at this and i think he was impressed more with Seth's input and the other things Seth has built around his room (and rightly so as a LEGO loving father i couldn't be more proud of his skill). As i said we will be using the build to review the LEGO advent calender and we've also bought last years too so that the boys have one each to add parts into the Death Star (I'm sure there are plenty of characters that want to join in the fun). Advent calenders have come a long way since i was a boy and the LEGO ones have got so much better over the years. We had so much fun building this together. What i love about it, is that it has put a huge smile on every ones face that has seen it. It just goes to show that a little effort and some quality family time spent sitting together and building can go a long way. Saw this on Instagram - it's brilliant! How many bricks, mini figs and hours did it take? Wow!! That is amazing- just saw these pics on IG , how did you make it so perfect? How did you find the parts? 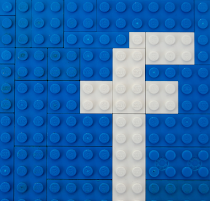 So do you have your lego on part number? Hey, cheers for the comment. It took around three weeks to make with my sons. They came up with a lot of the ideas. I couldn't tell you how many parts but we used around 25 minifigures in total. My sons are really loving it. Hey, cheers for the comment. The parts were found by rummaging through the LEGO we have (with the help of my 3 and 8 year old side kicks). We didn't count our parts but we did use a fair bit by the time we had completed.